We are delighted to have graphic artist Matthew the Horse (aka Matthew Hodson) contribute a piece to the Editions series. Matthew is based in Leeds and is known for his illustration and printmaking (and indeed poetry with his 'Forwards Always' book), and has a long and impressive list of clients. 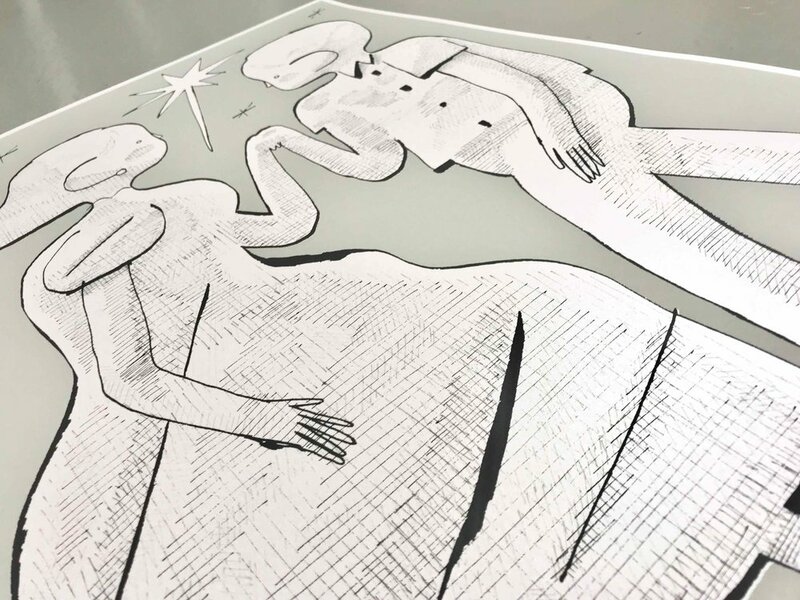 With 'Moondance' we have printed 3 complimentary greys onto GF Smith's beautiful Peregrina Majestic Marble White 290gsm, which has a stunning metallic/pearlescent shimmer when it catches the light. The intricate, illustrated lines (known as 'hatching'), overlap and create beautiful texture and depth. A2 size (420x594mm) in an limited edition of just 25 and it is exclusive to The Private Press 'Editions' series. Matthew: "Pictures on walls! Walls in our homes! I’ve always loved the notion of making a picture that perhaps might resonate with someone else enough for them to take it home and put it on their wall. What would that picture be? How would it work? I love designing prints, thinking about colour and composition and ideas. I was so happy that Gary asked me to contribute to Editions! Moondance is supposed to evoke a sort of nostalgia for falling in love. I don’t know, I was thinking about humanity and relationships and being outdoors. I wanted to capture something very grand and magical with a very simple and naive visual language. Lets dance x"